Aim: To determine the most efficacious anaesthetic technique in irreversible pulpitis by comparing the anaesthetic efficacies of Gow-Gates, Vazirani-Akinosi, Inferior alveolar nerve block with buccal infiltration and conventional Inferior alveolar nerve block (IANB) using 2% Lidocaine with 1:80,000 epinephrine as the anaesthetic agent in mandibular first molars. Methodology: 120 patients with inflamed vital pulp and lingering pain on removal of the stimulus were randomly divided into 4 groups in which the local anaesthetic was administered by the different techniques. Group I (n = 30) Gow-Gates technique. Group II (n = 30) Vazirani-Akinosi technique. Group III (n = 30) IANB with buccal infiltration. Group IV (n = 30) Conventional IANB. 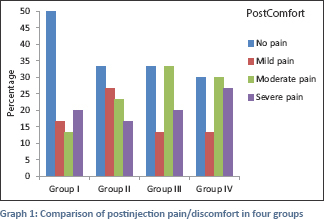 Anaesthesia was considered effective when ''no pain'' or “mild pain” felt by the patient during access preparation. Results: The Statistical software used were SAS 9.2, SPSS 15.0, Stata 10.1, MedCalc 9.0.1, Systat 12.0 and R environment ver.2.11.1. The results demonstrated that the Gow-Gates technique showed greater anaesthetic success (66.7%) followed by Vazirani Akinosi technique (60%) as compared to the conventional IANB. There was however no statistical significance observed between the groups. Conclusion: Gow Gates mandibular conduction block may increase the anaesthetic success rates in cases of irreversible pulpitis in mandibular molars as compared to other techniques. Dental treatment has been synonymous with pain since time immemorial, and this is the sole reason why patients are anxious in seeking it. Administration of local anesthesia is one of the first clinical procedures before the commencement of the endodontic treatment. Hence, efficient pain control is of utmost importance. Local anesthetics are highly effective in producing anesthesia in normal tissue, commonly fail in endodontic cases that present with an inflamed pulp. The inferior alveolar nerve block (IANB) has been the most frequently used local anesthetic technique for the endodontic treatment of mandibular teeth. Attaining successful mandibular anesthesia in irreversible pulpitis has been a challenge for the clinicians as its associated with high failure rates of 44%–81%., The inflammatory changes and anatomical variations could be the contributing factors. It has been shown that combining IANB with buccal infiltration (BI) provided more effective anesthesia with the success rates of 65.4% as compared to 14.8% of IANB with 1.8 ml anesthetic solution in irreversible pulpitis. The limited success rate of the conventional IANB led to the development of alternative techniques such as Gow-Gates mandibular nerve block and Vazirani-Akinosi technique. The Gow-Gates technique involves a wide mouth opening that is not feasible in patients with reduced mouth opening or any extra oral swelling diminishing extra oral landmarks. Often in clinical practice, patients present with endodontic emergencies and have reduced mouth opening. Akinosi, therefore, developed a closed mouth technique for such patients. There has been a scarcity of studies comparing the different anesthetic techniques in irreversible pulpitis. Hence, the purpose of this randomized clinical study was to determine the most efficacious anesthetic technique for irreversible pulpitis cases by comparing the anesthetic efficacies of Gow-Gates mandibular conduction block, Vazirani-Akinosi technique, IANB with BI and conventional IANB (control) using 2% lidocaine with 1:80,000 epinephrine as the anesthetic agent in mandibular first molars. The null hypothesis of this study was that there would be no difference in the efficacy of the anesthesia achieved irrespective of the technique of administration of local anesthesia for the mandible. One hundred and twenty systemically, healthy adult patients who had been referred to the Department of Conservative Dentistry and Endodontics, diagnosed with irreversible pulpitis of mandibular first molars requiring emergency root canal therapy were selected for the study. Based on the previous literature on outcome variables on pain score with minimum difference of any pair-wise group, 90% statistical power and 5% level of significance, the sample size of 120 was selected for the study with thirty patients in each of the four groups. The participants were experiencing pain and not taking any medication that would alter pain perception. Ethical clearance was sought from the College Review Committee, and an informed consent was obtained from each participant. Preoperative radiographs were obtained. The inclusion criteria for the study were active pain in a mandibular molar; prolonged response to cold testing with an ice stick and an electric pulp tester (Digitest: model number D626D, Parkell Inc., Brentwood, New York, USA); absence of any periapical radiolucency on radiographs, except a widened periodontal ligament; a vital coronal pulp on access opening; and patient's ability to understand the use of pain scales. Before initiating the treatment, the patients were asked to rate their pain on a 170 mm Heft–Parker visual analog scale (HP VAS). The millimeter marks were removed, and the scale was divided into four categories: “no pain” corresponded to 0 mm; “faint, weak, or mild” pain to 0–54 mm; “moderate” pain to 55–114 mm; and “strong, intense, and maximum possible” pain to more than 114 mm [Table 1] and [Graph 1]. The patients were randomly allotted into four groups with thirty patients each. Group IV patients received standard IANB injections using 2% lignocaine with 1:80,000 epinephrine (LIGNOx 2% A, Warren). The solution was injected using 27-gauge long needles (Unlock, Hindustan Syringes and Medical Devices). After reaching the target area, aspiration was performed, and 2.2 mL solution was deposited at a rate of 1 mL/min. Group I received Gow-Gates mandibular conduction block anesthesia. The patient was asked to widely open his/her mouth. A line was imagined from the intertragic notch to the angle of the mouth, along which the needle was inserted across the mesiopalatal cusp of the ipsilateral upper second molar keeping the syringe parallel to the divergence of the tragus. The needle was advanced until bony contact at condylar head was made, withdrawn slightly, aspiration was performed, and 2.2 mL anesthetic solution was deposited. The patient was asked to keep his mouth open for a further 2 min. Group II received Vazirani-Akinosi closed-mouth anesthesia. The ipsilateral cheek was retracted while the patient's mouth was closed, and the solution was injected by advancing the needle parallel to the occlusal plane at the level of the maxillary mucogingival junction. The needle was advanced until the hub was level with the distal surface of the maxillary second molar. After aspiration, 2.2 mL anesthetic solution was deposited. Group III received IANB with BI of 2% lignocaine with 1:80,000 epinephrine. After administration of 2.2 mL of anesthetic by the IANB, a BI of 1.1 mL of anesthetic solution is deposited. After administration of the anesthetic agent, the patient was asked if his or her lip was numb. If profound lip numbness was not recorded within 15 min, the block was considered to be unsuccessful, and the patients were excluded from the study. No response from the patient at the maximum output current flow from the pulp tester was used as the criteria for pulpal anesthesia. Statistical analysis of collected data: The collected data were subjected to statistical analysis using the ANOVA, Student's t-test, Chi-square, and Fisher's exact tests P < 0.05. The statistical software, namely, SAS version 9.2, SPSS version 15.0, Stata version 10.1, MedCalc version 9.0.1, Systat version 12.0, and R environment version 2.11.1 (IBM, USA) was used for the analysis of the data. One hundred and twenty adult volunteer participants, 59 men and 61 women, with an average age of 30 years, participated in this study. The samples were age- and gender-matched with P = 0.951 and 0.224, respectively. Patients reported with a mean initial pain value (VAS score) of 107.62 ± 37.48 that indicated moderate-to-severe pain. The comparison of the initial pain values in the four groups showed no statistical significance with P = 0.859. 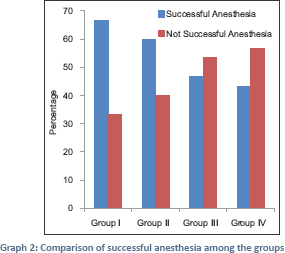 The percentage of successful anesthesia was highest in Group I with 66.7% followed by Group II (60%) and Group III (46.7%). In Group IV (control), the percentage of successful anesthesia was the least at 43.3% [Table 2] and [Graph 2]. There was no statistical significance with P = 0.222 between the groups studied; hence, the null hypothesis of the study was accepted. An important requirement before initiating any endodontic procedure is the ability to achieve and maintain profound pulpal anesthesia as it helps reduce patient anxiety and improves the operator's comfort and efficiency. Perception and transmission of endodontic pain is carried out by C and A delta fibers. The nociceptors are activated by mild temperature or pH changes in an inflamed pulp as their activity is modified by inflammatory mediators (prostaglandins and kinins). Hence, the pain experienced during irreversible pulpitis is considerably greater in intensity. As mandible has a thick and nonporous outer cortical plate, nerve blocks are administered at a site away from the teeth being treated. Patients with irreversible pulpitis have shown eight times higher rates of anesthetic failures than the normal individuals. The incidence of mechanical-allodynia in patients presenting with irreversible pulpitis was 57.2%. Root canal treatment in teeth with irreversible pulpitis is significantly more painful as compared to teeth with normal or necrotic pulps due to reduced mechanical pain threshold associated with mechanical-allodynia. Kohler et al. have shown that 1.8 mL local anesthetic solution is ineffective in providing adequate anesthesia with Gow-Gates mandibular conduction block. Dr. Gow-Gates advocated a slightly greater volume of solution, and it is said to aid in the high success of this technique. Hence, in the present study, a volume of 2.2 mL local anesthetic solution was used instead of the standard 1.8 mL cartridges, in all the groups for standardization. In Group III, an additional 1.1 mL of lidocaine was administered for BI following the conventional IANB. In the present study, Group IV showed the least successful anesthesia. This was in accordance with the findings of the previous studies that reported failure rates of 44%–81% in irreversible pulpitis., This could be explained by cross and accessory innervations by lingual, buccal, and mylohyoid nerves or cervical plexus; decrease in local pH; tachyphylaxis to anesthetic solutions; activation of nociceptors such as tetrodotoxin and capsaicin-sensitive transient receptor–potential vanilloid type 1., Other factors such as needle deflection have also been implicated. The peripheral afferent neurons have voltage-gated channels, transient receptor–potential channels, pain-modulating opioid and G protein – coupled receptors along their length., Gow-Gates and Vazirani-Akinosi techniques have shown a higher likelihood of bathing an accessory branch of the inferior alveolar nerve with local anesthetic, as they result in the drug being administered at a site higher than that accomplished by the traditional IANB. In the present study, Group I gave a higher success rate than conventional IANB. The site of solution deposition being higher than that in conventional IANB and gravity aids in the diffusion of the solution in an inferior direction that fills the pterygomandibular space till the buccinator. The length of nerve exposed to anesthetic solution is significantly greater as compared to the conventional IANB,, thus increasing the number of voltage-gated channels being exposed to local anesthetic solution. Major limitations with Gow-Gates are the operator's learning curve, dependence on extra oral landmarks, and hematoma formation in case of accidental injury to maxillary artery. Vazirani-Akinosi technique presented with a success rate of 60%. The higher success rate of this technique as compared to the conventional IANB in cases of irreversible pulpitis was in accordance with previous studies., This technique is particularly indicated if there is a history of IANB failure, evidence of anatomical variability and accessory innervation, trismus or a difficult visualization of the intraoral landmarks for IANB. The difficulties associated are the location of the intraoral landmarks when the patient's mouth is closed  and the absence of a bony contact end-point. In the present study, Group III showed a success rate of 46.7% which was higher than that of the control but lower as compared to the Groups I and II; this was in accordance with the previous studies., Supplemental infiltrations have shown to increase the success rates in patients with irreversible pulpitis.,, Of the various reasons that could be stated for the success of supplemental BI following IANB in mandibular molars, the mental foramen and the multiple minor perforations present in the body of the mandible aid in the diffusion of the anesthetic solution into the cancellous space. The drawbacks of this study include the dependence on the patient's perception and threshold for pain and the operator's skill in following the correct anesthetic technique. Further clinical studies are warranted using different anesthetic agents for these techniques. Within the limitations of the present study, it can be concluded that Gow-Gates mandibular conduction block may increase the anesthetic success rates in cases of irreversible pulpitis in mandibular molars. However, none of the techniques evaluated gave acceptable success rates. Meechan JG. Supplementary routes to local anaesthesia. Int Endod J 2002;35:885-96. Nusstein J, Reader A, Nist R, Beck M, Meyers WJ. Anesthetic efficacy of the supplemental intraosseous injection of 2% lidocaine with 1:100,000 epinephrine in irreversible pulpitis. J Endod 1998;24:487-91. Ingle JI, Bakland LK. Preparation for endodontic treatment. In: Endodontics. 5th ed. Hamilton, ON: BC Decker; 2002. Matthews R, Drum M, Reader A, Nusstein J, Beck M. Articaine for supplemental buccal mandibular infiltration anesthesia in patients with irreversible pulpitis when the inferior alveolar nerve block fails. J Endod 2009;35:343-6. Parirokh M, Satvati SA, Sharifi R, Rekabi AR, Gorjestani H, Nakhaee N, et al. Efficacy of combining a buccal infiltration with an inferior alveolar nerve block for mandibular molars with irreversible pulpitis. Oral Surg Oral Med Oral Pathol Oral Radiol Endod 2010;109:468-73. Haas DA. Alternative mandibular nerve block techniques: A review of the Gow-Gates and Akinosi-Vazirani closed-mouth mandibular nerve block techniques. J Am Dent Assoc 2011;142 Suppl 3:8S-12S. Akinosi JO. A new approach to the mandibular nerve block. Br J Oral Surg 1977;15:83-7. Meechan JG. How to overcome failed local anaesthesia. Br Dent J 1999;186:15-20. Aggarwal V, Singla M, Kabi D. Comparative evaluation of anesthetic efficacy of Gow-Gates mandibular conduction anesthesia, Vazirani-Akinosi technique, buccal-plus-lingual infiltrations, and conventional inferior alveolar nerve anesthesia in patients with irreversible pulpitis. Oral Surg Oral Med Oral Pathol Oral Radiol Endod 2010;109:303-8. Suresh KP, Chandrasekhar S. Sample size estimation and power analysis for clinical research studies. J Hum Reprod Sci 2012;5:7-13. Ikeda H, Tokita Y, Suda H. Capsaicin-sensitive A delta fibers in cat tooth pulp. J Dent Res 1997;76:1341-9. Owatz CB, Khan AA, Schindler WG, Schwartz SA, Keiser K, Hargreaves KM, et al. The incidence of mechanical allodynia in patients with irreversible pulpitis. J Endod 2007;33:552-6. Hargreaves KM, Keiser K. Local anesthetic failure in endodontics: Mechanisms and management. Endod Topics 2002;1:26-39. Malamed SF. Handbook of Local Anesthesia. 5th ed. St. Louis: CV Mosby; 2004. Tortamano IP, Siviero M, Costa CG, Buscariolo IA, Armonia PL. A comparison of the anesthetic efficacy of articaine and lidocaine in patients with irreversible pulpitis. J Endod 2009;35:165-8. Claffey E, Reader A, Nusstein J, Beck M, Weaver J. Anesthetic efficacy of articaine for inferior alveolar nerve blocks in patients with irreversible pulpitis. J Endod 2004;30:568-71. Kohler BR, Castellón L, Laissle G. Gow-Gates technique: A pilot study for extraction procedures with clinical evaluation and review. Anesth Prog 2008;55:2-8. Chaudhary P, Martenson ME, Baumann TK. Vanilloid receptor expression and capsaicin excitation of rat dental primary afferent neurons. J Dent Res 2001;80:1518-23. Gow-Gates GA. Mandibular conduction anesthesia: A new technique using extraoral landmarks. Oral Surg Oral Med Oral Pathol 1973;36:321-8. Goldberg S, Reader A, Drum M, Nusstein J, Beck M. Comparison of the anesthetic efficacy of the conventional inferior alveolar, Gow-Gates, and Vazirani-Akinosi techniques. J Endod 2008;34:1306-11. Fan S, Chen WL, Pan CB, Huang ZQ, Xian MQ, Yang ZH, et al. Anesthetic efficacy of inferior alveolar nerve block plus buccal infiltration or periodontal ligament injections with articaine in patients with irreversible pulpitis in the mandibular first molar. Oral Surg Oral Med Oral Pathol Oral Radiol Endod 2009;108:e89-93. Aggarwal V, Jain A, Kabi D. Anesthetic efficacy of supplemental buccal and lingual infiltrations of articaine and lidocaine after an inferior alveolar nerve block in patients with irreversible pulpitis. J Endod 2009;35:925-9. Yadav S. Anesthetic success of supplemental infiltration in mandibular molars with irreversible pulpitis: A systematic review. J Conserv Dent 2015;18:182-6. Jena A, Shashirekha G. Effect of preoperative medications on the efficacy of inferior alveolar nerve block in patients with irreversible pulpitis: A placebo-controlled clinical study. J Conserv Dent 2013;16:171-4.